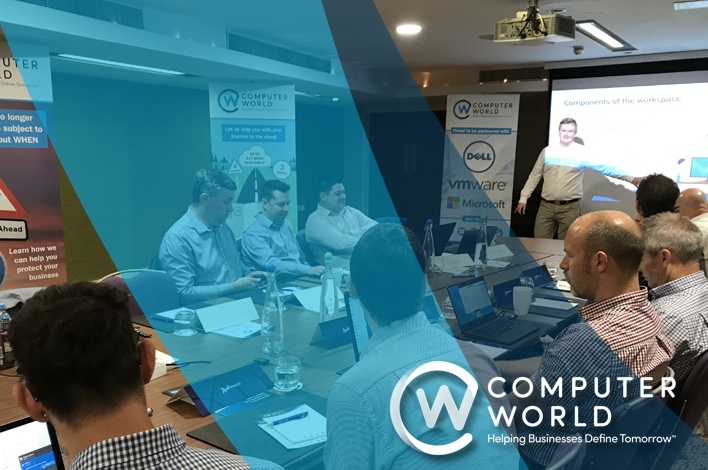 A special thank you from all the team at ComputerWorld for attending our VMware Update 2016 event. We hope you enjoyed the event and were able to take away some key information to further help you Define Tomorrow for your business. On this page you will find the presentation recordings, slide decks and links to all our follow up workshops and webinars. At our recent Define Tomorrow event in Bristol, Joe Baguley, VMware CTO delivered a visionary presentation covering a wide range of subjects including IoT, Cloud, Edge Computing, Containers, AI and much more. Barry Coombs, presented the Software Defined Data Centre (SDDC) and the components that encompass this; Compute, storage, network and management. Barry spoke about the technologies with the SDDC including vSAN, VxRail, VMware Cloud foundation and vSphere 6.5. Josh presented VMware's Software Defined Networking solution, NSX. Josh covered the three initiatives of NSX, Security, automation and app continuity and what the future of NSX looks like. Jamie Woodruff, Europe's number 1 ethical hacker delivered a thought-provoking security keynote using his experience as an ethical hacker to prove how vulnerable and naive businesses still are when it comes to security. Ruben Spruijt presented his motivating presentation about the workspace of 2020-2025 and what businesses should be doing now to prepare for this. Following Ruben Spruijt's presentation that outlined what the workspace of 2020 will look like, Barry Coombs discussed which technologies, including Onedrive, Workspace ONE are going to help customers get to this workspace and ensure their business and users are flexible. Peter Barnes, Dell EMC VP presented a jam-packed whiteboard about where the industry is and how Dell Technologies is helping transform business and services. Our datacentre's have changed vastly over the last 5-10 years, but how has your network changed? With a vast number of your servers now virtualised and an increased risk of cyber-attack, we have to modify our networks to be more secure and more flexible. Join specialists from VMware and ComputerWorld as we introduce VMware NSX, look deep into the technology and use case and let you get a first hand experience with hands on labs. Mobile and cloud technology is changing the face of the desktop forever, providing users with the ability to be truly flexible and collaborate in new ways. However the corporate desktop is not keeping up with the rate of change, due to security risks and technical complexities. Join ComputerWorld and VMware for this interactive workshop as they present their vision of the digital workspace for the future, incorporating solutions that allow you to take a staged journey to secure and mobilised corporate applications and data. With IT infrastructure now so critical to a business on many levels, an outdated data centre can hamper efficiency and productivity, handing your competitors an advantage. Examining your existing infrastructure to see if it meets current and future business requirements is critical, and companies need to be prepared to invest in their data centres to stay competitive. Refreshing your data centre may be an expensive job, but it’s a business-critical one. Join our new webcast, which is all about the GDPR and practical tips on how Netwrix Auditor can help you address its requirements. The EU General Data Protection Regulation is coming, and it’s closer than you think. Are you worried that your organization’s IT security is not strong enough? Don’t know where to start or how to comply with requirements of this standard? We will demystify the GDPR and tell you everything you need to know about its most essential paragraphs. How to address the GDPR provisions with Netwrix Auditor. Join our Microsoft Specialist, Oli Restorick and Operations Director, Barry Coombs for this hour long webinar where they will discuss all things Office 365. Brief discussion of the past, Exchange-led Office 365, etc. Windows autopilot demo - enrolment of a shop-bought PC into MDM, changing Windows SKU and installing software. Lead on to discussing how modern management of PCs differs from the past by managing PCs using MDM-style management. Changes announced at Ignite: barriers to hybrid Exchange are being eased, ability to remove your last Exchange server, new authentication options (seamless SSO), Microsoft 365 SKU (Office, Windows, EMS in one per-user license). Future of SfB and Teams (two iterations then change the name, Skype is communications, Teams is collaboration). Ability of older Office versions to connect to O365 services in future.